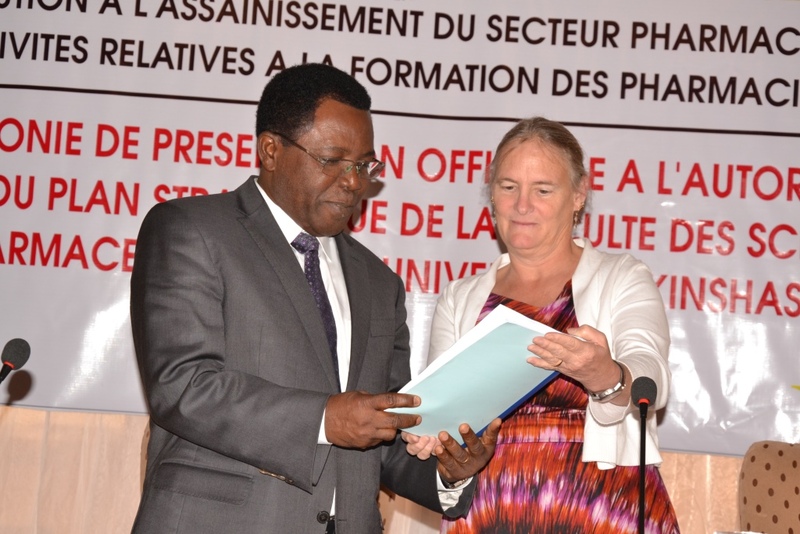 On June 10, 2015, the Faculty of Pharmaceutical Sciences (FOPS) of the University of Kinshasa in the Democratic Republic of Congo (DRC) officially presented its first-ever strategic plan to the Ministry of Higher Education. The strategic plan lays out a FOPS curriculum for the 2016-2020 period, and was developed with the technical and financial assistance of the USAID-funded SIAPS Program. The plan’s development was based on recommendations of the American Agency for Accreditation of Pharmacy Education (ACPE), which conducted the evaluation of FOPS in July 2014. Higher Education Minister Théophile Mbemba Fundu and USAID DRC Mission Director Diana Putman at the launch of the country’s first strategic plan for pharmacist training. The event was attended by health professionals, academics, and all key stakeholders, including the Minister of Higher Education, Professor Théophile Mbemba Fundu and USAID DRC Mission Director Diana Putman. Mission Director Putman said she was excited to see the creation of a strategic plan for FOPS—a milestone that stands as a testament to the collaboration between the faculty and USAID through SIAPS. She emphasized USAID’s commitment to accompanying and supporting the overhaul of the FOPS training curriculum to ensure delivery of quality education that meet international standards. The USAID vision is to see the University of Kinshasa become one of the leading training institutions in DRC, Ms. Putman said. She reiterated the USAID commitment to supporting FOPS in ensuring the availability of well-trained pharmacists capable of contributing to—and actively participating in—health care management. Mr. Mbemba also commended this achievement and presented a token of appreciation to USAID and SIAPS for their assistance. He said the developed strategic plan constitutes a favorable response to the challenges related to pharmaceutical governance that challenge the country’s pharmacy sector. Mr. Mbemba urged other training institutions to follow the Faculty of Pharmaceuticals Sciences example, saying the strategic plan should be used as a model. He also added that the ministry will from now on only enter into contracts with faculties that have established strategic plans. The event concluded with the handover of the strategic plan to the Minister of Higher Education by Ms. Putman.